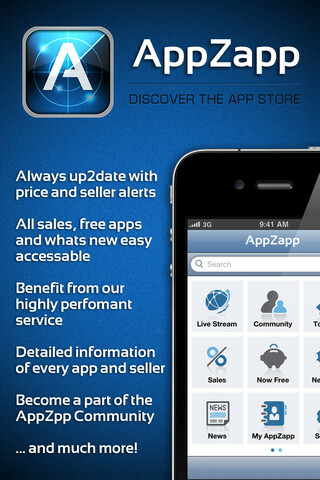 Home Application Applications iPhones Review Stay On Top Of New Apps And Discounts With AppZapp! Stay On Top Of New Apps And Discounts With AppZapp! With the huge and ever-increasing amount of apps available in the Apple App Store, it is fairly hard to find the one that will be customized to all your needs. But here comes the AppZapp, promising to be the best Bargain Guide for the App Store. To make sure you never miss a discount again, take a quick glance on the review and confirm that to all! The 600.000 + apps available via iTunes at the moment is no constraint for AppZapp to find all changes extremely fast and show them in well sorted lists to you. With this app in your phone you are guaranteed to always be on top of what’s going on in the App Store in real time! • Become a part of the AppZapp Community ... and much more! Additionally, AppZapp delivers the top newcomer apps, most viewed, most liked and probably the most extensive list, the Top 400 with the help of a specially developed algorithm. Even if you are not sure what you’re looking for, you’ll effortlessly find the app for you! Moreover, the community of AppZapp users will help you make the right choice with their likes and comments on each and every app available.